Students from 35 high schools attended Career Day at the Rhodes State College campus. LIMA — It was quite the scene at the Rhodes State campus Friday morning. About 40 school buses arrived, packed with students, eager to know more about what Rhodes State College has to offer them. “This is a huge day. This is one of our largest recruiting events that we have on campus. 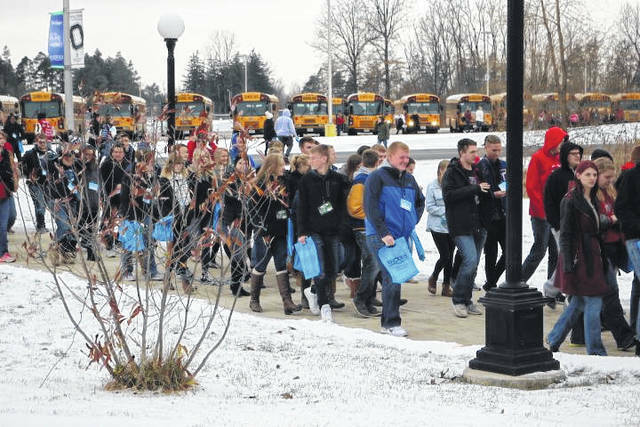 We have over 1,700 high school juniors from 35 high schools,” said Krista Richardson, director of career development. The students were broken up into smaller groups and rotated through several areas on the campus. “This is a great opportunity for students to come on campus. Many of them are either college credit plus students or maybe they haven’t been on campus before. It’s a great opportunity for them to come on campus. Many of them have never been on a college campus before and to explore the campus, explore what a typically day might be like. They’re actually going into our sessions. A lot of them are instructed by our faculty and some of our employer partners and a lot of our alumni are in some of these sessions as well, giving students information on what a simple day is like, what type of educational requirements are required, what the pay scales might be like and what they can do now to start preparing for that career in the future,” she said. “A lot of these sessions are highlighting our associate of arts and associate of science transfer degree pathways. Those start here, go anywhere. Then the other ones are highlighting the majors that we have here on campus, anything from our agricultural technology, our food science technology to nursing to electronic engineering, mechanical engineering technologies,” Richardson said. The career pathways that are offered at Rhodes State are determined by the community they serve. “It’s a two-year college and we’re here to serve the students and to serve our employers in our community, so a lot of these majors and certificate programs that are offered here on campus are in response to what the employers need out in the community, and so then students can come here and start their education and transfer for a bachelor’s degree or they can start here and then, like I said, go into some of those high paying careers,” she said.